New York circa 1948. "The new Hudson." From a design standpoint, the venerable carmaker's last hurrah. 4x5 acetate negative by John M. Fox. View full size. Submitted by Mercury on Wed, 03/18/2015 - 9:51pm. I remember riding in my great-uncle's Hudson of that era a couple of times in the 1950's--and still remember the spacious of that backseat--it seemed bigger than my bedroom (or seemed so with that unique shape)! Submitted by 1fstcat on Tue, 03/17/2015 - 7:17pm. 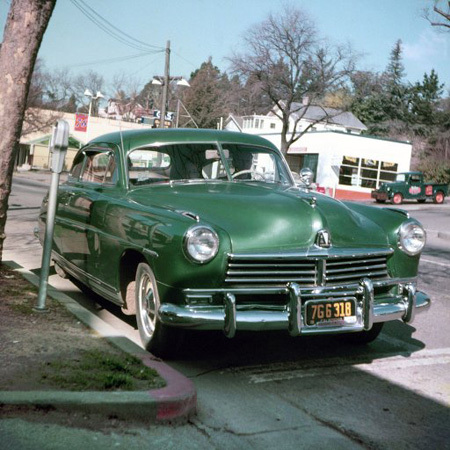 In 1972, at the age of 20, I had a 1952 Hudson Hornet. I loved that car and anything that was from the Hudson Motor Car Co. But that was not enough. No, I had to go and buy a 1948 model just like this one and because my folks would not be happy at all about me having TWO Hudsons (I drove them absolutely crazy constantly talking about Hudsons). I hid the 1948 Hudson at the shop I worked at! Well, long story short, my 1948 car bought from the original owner, still with never-sat-in seats under the Scotch Plaid factory seat covers, had to be sold because I could never let them know that I had it. Wish I had it now. These were terrific quality cars that deserved to not go out of business. Submitted by Jano on Tue, 03/17/2015 - 6:38pm. 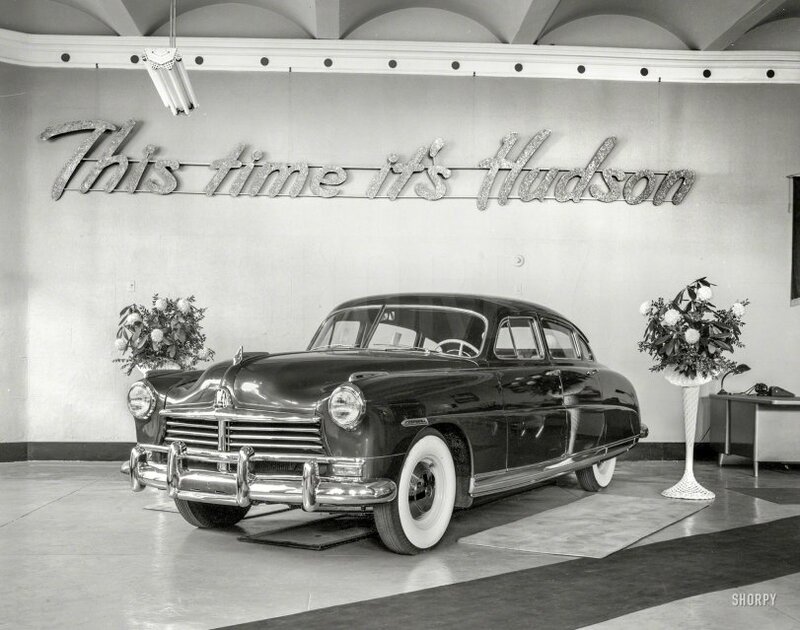 Though Hudson produced cars through 1954, there is something presciently funereal about this image--as if the bouquets are memorials from loving relatives. Submitted by mg2288 on Tue, 03/17/2015 - 6:36pm. as well as drips were normal on new vehicles. The "trostel seals" in earlier days were leather with a spring wrap loading. They had to be "broken in" to make sure the leather seam did not weep. When broken in correctly, they had long life. Trostel was in Milwaukee and had a rich source of leather (think meat packing, sausage) in the old days to make seals of this nature, along with the other manufacturers that could make the inner wrap springs and outside races. Submitted by OldFogie on Tue, 03/17/2015 - 2:00pm. When I was in highschool and of that age with a nearly-empty wallet but a pocket full of unmatched wrenches, I got all too well-acquainted with the local salvage yard owner and his wife. Between them, they had six teeth and enough hair for two poorly distributed. They had only one car carefully stored in a good building while the rest rusted outside--a 1948 Hudson just like this one, in black, with camel interior. I took a good gander at it one time, simply because my mother's sister still reminisced about her '48 even then, nearly 30 years later. Wherever her husband was stationed in Europe after WWII, they took her '48 Hudson, at her insistence, finally shipping it home to D.C. in the late 50s. She said it was the only car she ever owned that she truly loved. She drove it until the mid-sixties. Looking at the nice example carefully stored at that salvage yard, I could see a lot to like and understood her perspective. The build quality was really nice and the ergonomics of form following function well ahead of the competition. Submitted by tterrace on Tue, 03/17/2015 - 1:36pm. I grew up in this one. One of my first Shorpy postings. Submitted by EastsideAl on Tue, 03/17/2015 - 1:10pm. In 1947 and 48 both my grandfather and my father were employed at the Hudson plant on Jefferson Ave. on the east side of Detroit. My dad, now 89, was working his way through college at Wayne U. (now Wayne State) swinging engine blocks. My grandfather though worked at Hudson (always referred to as "Hudson Motor Car" in Detroit, to differentiate it from the tangentially-related J.L. Hudson department store) from the early 1930s until the Jefferson plant closed in 1955. He was a diesetter and thus was responsible in part for shaping the stamping of body panels on all Hudsons for many years. I cannot look at a Hudson, and its beautifully curved bodywork, without thinking about my grandfather and his talks (which almost all went over my little kid head) about the intricacies of auto body and machine tool design, and his admonitions about the importance of precision in one's work. Submitted by switzarch on Tue, 03/17/2015 - 11:36am. One of the early champions in what used to be NASCAR. Submitted by Doubleclutchin on Mon, 03/16/2015 - 9:54pm. This was the famous and popular "stepdown" Hudson that pioneered the concept of carrying the floor pans below the frame rail level, thereby radically lowering the car's profile with no loss of headroom. Had Hudson completely re-styled after the expected three years instead of delaying until 1955, this fine marque may well have survived for many more years. Submitted by SteveLexington on Mon, 03/16/2015 - 7:56pm. The Step Down Hudsons truly were the last hurrah. But it would have made for a better picture if the photographer had bothered to remove the drip pan first.